I finally found an art project that my 5 year old son loves and doesn’t want to quit as soon as possible! Zentangle® inspired drawing! I have such a hard time getting my kids excited about art, this is a joyous post to write! As many of you know, we like to use journals for learning activities, like keeping track of the latest obsession, or recording curious questions. Last summer I started art journals with the kids and one of the projects I had in mind was Zentangles. Our summer art journaling was not as successful as I had hoped but we finally got around to a little Zentangle drawing. In Zentangle there are no rules except that each shape needs to be filled up. We started out with a blank page in the journal. I LOVE these journals because the paper is thick enough for watercolor or collage and even though the Sharpies do bleed onto the backside of the paper, they don’t go all the way through to the next sheet. I drew the black outlines for my 5 year old to get him started. Zentangle drawing traditionally starts out with black patterning, but I knew the colored Sharpies would be much more enticing and I really wanted to emphasis the “no rules” part. I think he felt free because he wasn’t being expected to draw “something”. Both my kids express frustration over their drawings “not being good” even though I’ve never emphasized the representational aspect of art, and heaven knows I am no model of stellar artistic talent! At one point he decided that he wanted to use two pens at the same time. No rules! When I said, “do you want to know how to make a spiral?” he answered no but then I just started doing them anyway and he was drawn (pun) into them. Eventually he filled 4 journal pages. He even said, “thanks for doing this with me, mom.” I’m pretty sure he has never thanked me for doing art with him before! Victory! 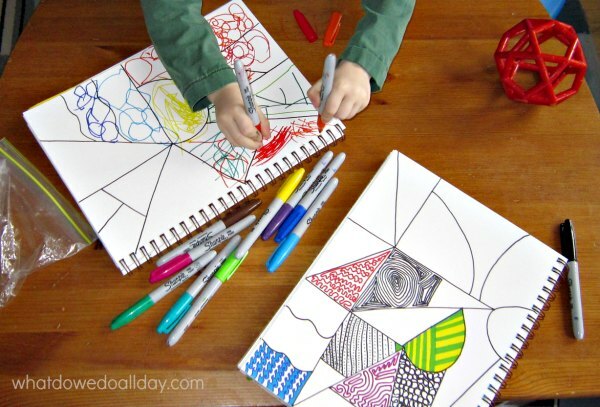 Have you ever tried Zentangle art with your kids? 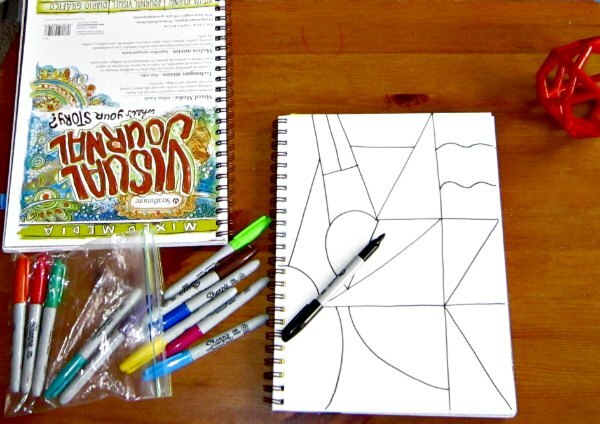 There are lots of resources out there which will tell you “how to make Zentangles,” but I say, throw all that out the window and let the imagination roam. Yet another gem, Erica! 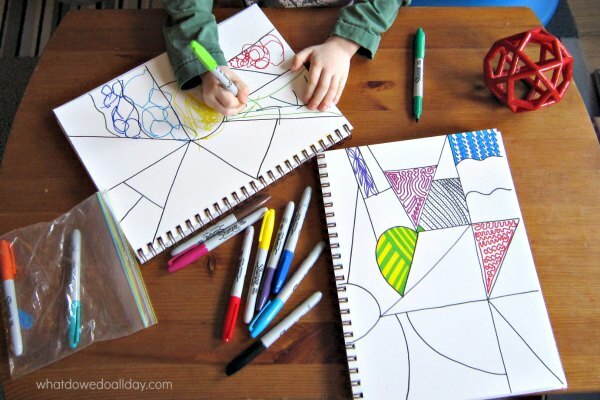 I have never done art journaling with my kids, but I am going to try this with them. Thank you for sharing it! Yay! I’m glad it’s something new for you. I hope you enjoy it. I’ve really loved Zentangles. Good even for adults like me who don’t have much natural artistic talent. First, let me preface this by letting you (and anyone else reading this) know that I am disabled due to chemical injury. I have suffered with symptoms for nearly 40 years. I’m speaking from first hand experience AND a vast enough wealth of knowledge on this subject. I am also an artist. Before I go on, let me say many products by Sharpie are terrific. I use them myself, especially their highlighters. There are no fumes which enables me to use them. On the other hand, due to my chemical sensitivity, I HAVE to use the Sharpie permanent markers with proper ventilation. Truth be told—everyone should. The permanent markers should only be used when you truly need something written on a surface that needs that kind of chemical pen or has to be waterproof. In my opinion, adults should use caution when using them, especially for prolonged periods, and children should never be using these type products. If the marker isn’t washable, it shouldn’t be in their hands and they certainly should not be breathing in the fumes. There are many marker sets with beautiful, assorted colors which are available and safe. Your son will be just as drawn to them if he sees you using them. In fact, even Flair pens come in a wide array of colors now. I’m sorry I had to say this, but I consider it MORE than important. When I was young I was never taught about harmful chemicals. My family never paid attention to any of it, regardless of all the construction we did and pretty much everything you can think of. In school, in art class, I used to wash oil paint off my hands with turpentine. We are constantly exposed to toxins in many of the environments we’re in and through the products and items we surround ourselves with every day. I use to think if a company sold it, it had to be “OK,” that we were protected by the EPA, FDA, etc. Wrong. Thank you so much for this comment, Donna. I’m sort of a little embarrassed I didn’t think of it before. I have eliminated so many chemicals – like toxic cleaning supplies and toiletries from my kids’ lives but I didn’t think of the Sharpies. That is good to know about the Flair pens. Those are the pens they use in school. I’m going to get a rainbow pack ASAP! Thanks for the great tutorial. I had seen other posts about zentangles, but this looks much less complicated. I think my kids would love it. What fun! This would be great to do while waiting at a restaurant or a doctor’s office. What fun! And what creative and beautiful designs. We love journaling and the kiddos journal every day. We’ve done similar type drawings during our art time. Doodling can be so refreshing. I’ve never heard of Zentangles, but they sound interesting. 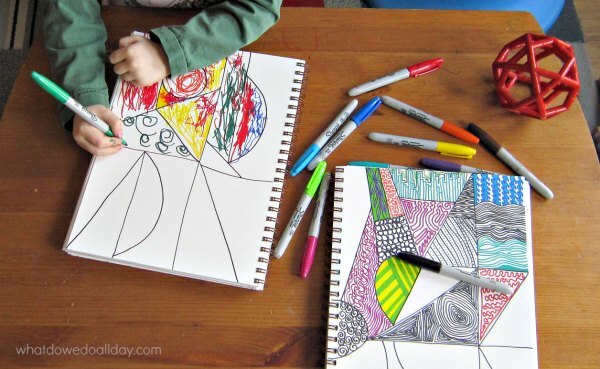 If they have a calming effect, maybe my 5-year-old and I could both use some “zentangling” of our own! lol! I did this today with my five year old. He is usually more into “messy” art but he was surprisingly very focused! Thanks for the inspiration! I’m so glad it worked for you, Mandy. Thanks so much for taking the time to let me know! Hi Erica, I’m wondering if you pre-draw the lines or if you let your kiddos do it? 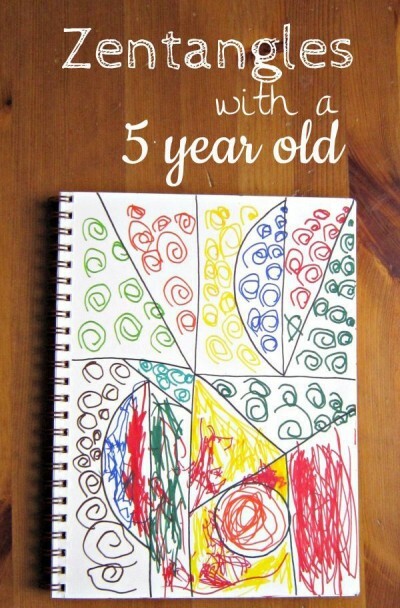 I’m planning to do this with my 5 year old also. I drew the lines for him, but really that was only because he wanted me, too. If he wanted to make the lines, that would have been fine with me. I hope you have fun with it! I did this today with my children. We all really enjoyed ourselves and my son (6 years) completed one… although he was reluctant at first …he ended up feeling pleased and proud of himself… Thank you for introducing us to this! P.s. we don’t have any sharpies… but I have been sorely tempted a few times… thanks to Donna, I won’t be tempted anymore. I’m so happy to hear that it went well! I don’t miss the Sharpies, even though I thought I would. My son draws ZenTangles on post-it notes. He’s 12, so has better fine motor skills than young ones, but the small space gives him the freedom to know he only needs to fill that small space. He began with pencil, then progressed to black pen. Now he uses colored pens given to him as a gift by a friend who also draws ZenTangles. He loves it! I love the idea of doing it on Post-its! I love the idea of this. I’m going to have to give it a try. If you are still finding it challenging to get your boys to draw. ( or even if you are not). I would recommend Peter Reynolds book “Ish”. It is a cute story that inspires anyone to make ish drawings. Thanks, Heather. Ish is a great book!